Adopt-A-Bog "pick your own cranberries"
We are offering the “adoption” of 100 sq. ft. plots of cranberry bog for $125. Similar to a Community Supported Agriculture (CSA) program that has become a popular way for consumers to buy local, seasonal food directly from a farmer. Behind The Scenes "Cranberries 101" Tour is an opportunity to see and learn all about cranberry growing directly from the grower. You get one on one time with the grower taking you on a tour of the farm. 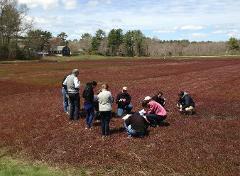 Bog side tour with millions of cranberry blossoms. This event includes a Behind The Scenes tour of the cranberry bogs and a jar of cranberry blossom honey from our beekeeper. Have a hearty cranberry lunch and get ready to harvest a load of cranberries. This program gives you a meal and experience of getting in the bog and helping load cranberries to take to market.